Story: Heading home from the swimming pool, Julián and his abuela see mermaids on the subway. His imagination soars as he reads his book because, "Julián LOVES mermaids," telling his grandmother, "Abuela, I am also a mermaid." While Abuela is taking a bath, Julián becomes a mermaid, using ferns fronds, flowers and the lacy curtains. When Abuela emerges from her bath, her silence and stern expression give Julián (and the reader) a pregnant, slightly tense, pause. 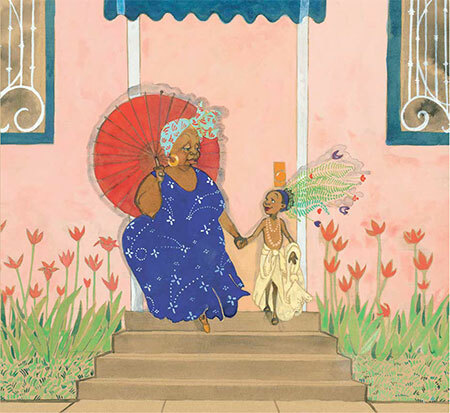 She disappears and returns, holding something behind her back (readers paying close attention to the illustrations will notice that Abuela's post-bath dress is the same color and pattern as the generous fish from Julián's mermaid fantasy). Reaching out, a necklace in her hand, she says, "For you, Julián." Hand in hand, the two head out the house and towards the beach where Julián sees more mermaids. "Like you, mijo. Let's join them," Abuela says. Together, joyfully, they become part of the exuberant annual Coney Island Mermaid Parade. The 36th annual parade was on June 16th this year! 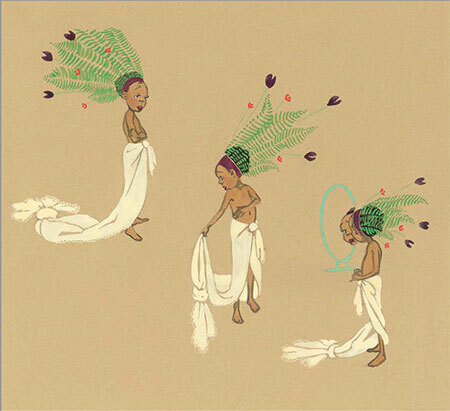 Because all the characters in the book are brown skinned people, the more delicate shades of their skin weren't showing when we digitally scanned the illustrations, because the contrast was too sharp against the white, white paper. It occurred to me that it actually doesn't make sense to have white be the "neutral" color for this story, the neutral color for this story should be brown. So I did the whole book over again on brown paper, and suddenly you could see if a character was blushing, if one had slightly warmer toned skin, or if someone had a dimple. The colors became more vibrant. The whole book felt like it was suddenly at home on paper that was the color of a brown paper bag. There isn't a character in the book who is lighter-skinned than that color. White is no longer the neutral (common) color. When you change this, all the colors become more vibrant. Love's book is one of the most vibrant, vividly alive books I have seen in a while. From the delicate details and patterns that fill the pages to the cool green of the water and the pale pinks and yellows of the walls, everything about Love's illustrations speak of creativity, exploration, joy and celebration. So much so, that almost immediately after my first reading, I went to Love's shop and bought a print of "The Swirl." Each and every character in this book is unique and real - you can almost imagine their stories, their lives, where they are headed when they leave the page - because of the humanity they embody. Why Read? Why Buy? : Love's book, which is her debut as a picture book author and illustrator, is powerful, powerful in a way that I rarely experience in a kid's book. Not only is it powerful, it is remarkably accessible for readers of all ages. Yes, there have been many picture books over the past years with gender-fluid characters, but they all tend to have overt messages about the importance of acceptance. Julián Is A Mermaid goes beyond the importance of acceptance and shows readers that there is a big, welcoming community waiting. Love doesn't need words to inform readers about gender-fluidity or playing with gender because her text tells readers immediately that Julián is a boy. And Julián loves mermaids. Without words, Love marvelously, brilliantly creates a potential conflict and builds suspense, resolving it over four pages. But, this is not the story of this book. 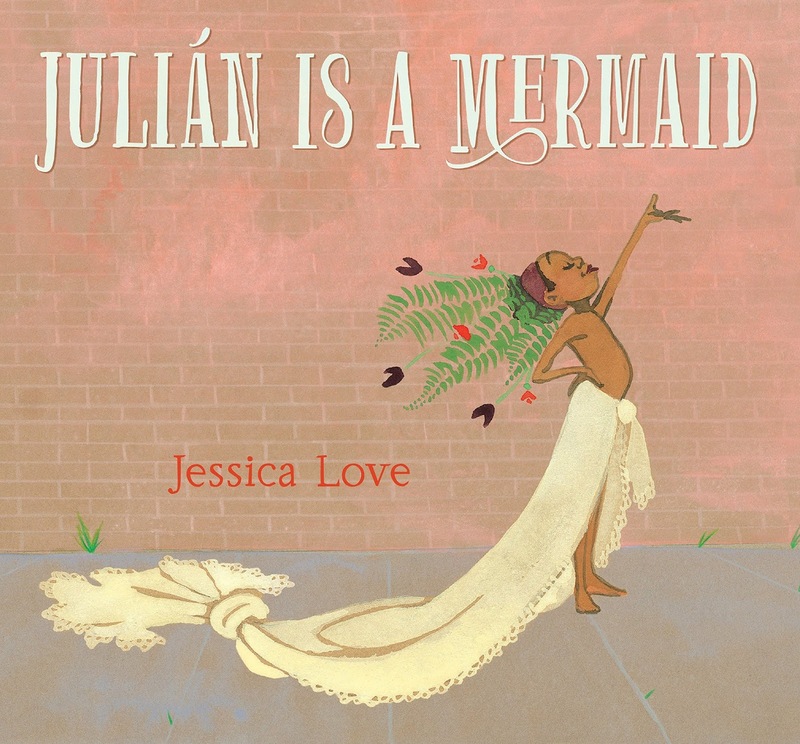 As I said above and want to say again, Julián Is A Mermaid is a book about community and connection. And, to me, community and connection is what being a human being is all about. For my money art isn't actually the object itself. I believe "art" is what happens when the thing the artist tosses out in to the universe like a ball, is caught. This is why I can't stand didactic children's books. The reader completes the circuit, making sense of the thing the artist has made. I think if the artist does not leave room for the reader to stretch, to fill in the blanks and make a connection, then there is no possibility of that electrical current jumping between the artist and the audience. I think my best work is always created with this alchemy in mind, when I am drawing for someone I will never meet, who may catch the ball I have tossed perhaps after I am dead, and feel that thrill of connection: they have been seen, thought of, and whispered to by someone they will never meet.